A pinched nerve is the result of excessive pressure being applied to a nerve. This pressure can come from muscles, bones, tendons, or cartilage and causes a disruption in the nerve’s ability to function. This causes a variety of symptoms including pain, numbness, tingling, and weakness. In the spine, a herniated disc can put pressure on the nerve root, causing pain and discomfort. In the wrist, it can cause a condition known as carpal tunnel syndrome. Why is a Pinched Nerve so Challenging? The issue with a pinched nerve is finding the source. 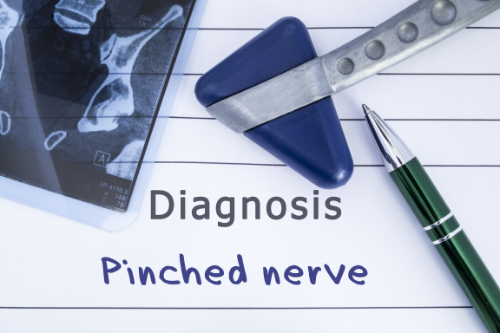 When a nerve is pinched, the pain and other symptoms may not be at the actual site. Instead, the pain and other sensations can travel to other parts of the body, including down the leg or through the arm. This can make it difficult to treat, but an experienced, knowledgeable chiropractor can assess the situation and treat the condition, bringing relief to the patient. When the nerve is not pinched for very long, it typically does not leave the patient with any permanent damage. When the pressure is relieved, normal function returns rather quickly. On the other hand, if the pressure is not relieved, it can cause permanent damage to the nerve, leading to chronic pain. What are the Treatments for a Pinched Nerve? The first line of treatment for a pinched nerve is rest. Medications may be recommended or prescribed, such as NSAIDs and muscle relaxers, but remember every drug has side effects so make sure you talk to your medical doctor before moving forward. Physical therapy is another common treatment. The patient is taught certain exercises that stretch and strengthen muscles around the pinched nerve so that it relieves pressure. They are also given self-management techniques that they can do at home to get relief. However, if the pinched nerve is do to a misalignment in the spine, it doesn’t matter how many exercises you do; they won’t fix the problem. In severe cases, surgery may be recommended. This is usually a last resort. Does Chiropractic for a Pinched Nerve Really Work? Chiropractic care is a very effective treatment for pinched nerve because it addresses the root cause and works toward fixing the problem through spinal manipulation and very specific chiropractic adjustments. By bringing the body into alignment, pressure on the nerves is relieved. This helps relieve the pain, but also facilitates healing allowing the patient to return to their normal daily activities and experience less down time.